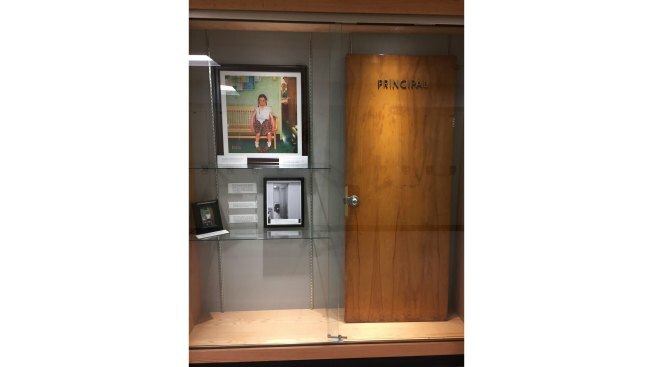 This Dec. 20, 2017, photo provided by Cambridge Central Schools shows a display case with photos, an illustration and the door that was once on the Principal's office at Cambridge Central Schools in Cambridge, N.Y. Inside the case is the original door from the principal's office that served as the setting for the Normal Rockwell Saturday Evening Post cover in 1953, known as "Girl With Black Eye," or "The Shiner." Steve Butz, a science teacher at Cambridge High School, preserved the door for display after it was replaced during a renovation project. When voters in Cambridge, New York, decided the town school was due for a renovation, science teacher Steve Butz knew there was one piece of the 1950 building that deserved to be preserved: the door to the principal's office. The plain door once served as a model for one of Norman Rockwell's iconic paintings, "Girl With Black Eye," also known as "The Shiner" and "Triumph in Defeat." "Holy cow!" Butz recalled thinking when he learned the school intended to discard the door as part of the $11 million rehabilitation. "We should save it." In 1953, Rockwell drove the short distance from his studio in Arlington, Vermont, to Cambridge, a village among rolling farmland 35 miles northeast of Albany. Rockwell often used local residents and locales for settings in his work for The Saturday Evening Post. In Cambridge, he found inspiration for his depiction of a schoolgirl awaiting her turn in the principal's office after getting into a fight. Rockwell took photographs of the principal's office and the door as well as the principal and his secretary. He even had the door taken off its hinges and brought to his studio. Later at his studio, he photographed models standing in for the principal and secretary. His studio photo shoots also included Mary Whalen Leonard, then 11, who wound up serving as the model for the feisty, plaid skirt-wearing girl with the post-fight disheveled pigtails. Rockwell, who later moved to the Berkshires in Massachusetts, was "like a movie director," said Stephanie Plunkett, deputy director and chief curator of the Norman Rockwell Museum in Stockbridge, Massachusetts. "He would tell his models how he wanted them to pose, what expressions he wanted," she said. "Sometimes he would even act out the scene." The resulting artwork for "The Shiner" appeared on the cover of The Saturday Evening Post's May 23, 1953, edition. The original oil painting is part of the collection of the Wadsworth Atheneum Museum in Hartford, Connecticut. Leonard, whose father was Rockwell's lawyer, had already posed for one of the artist's Saturday Evening Post covers when he asked her to do another. "He said, 'Wouldn't you just love to win a fight with one your brothers? That's the kind of smile you have to have,'" Leonard, now 75, said Thursday. "So he just pulled that smile out of me that day." The renovation of the building that now houses the Cambridge elementary and high schools called for reconfiguring elementary principal Colleen Lester's office and replacing the famous door. Butz received approval to preserve the door as part of an exhibit on the school's key role in one of Rockwell's most famous works. The door has been placed in a glass display case near the school's library since November, accompanied by some of Rockwell's black-and-white reference photos and a framed copy of the Saturday Evening Post cover. Students think it's "cool" that a piece of local lore with national appeal has been preserved and put on display in their school, Butz said. The door is serving as a teaching tool for art students learning how artists such as Rockwell approach their work, he said. "There was a whole process" the illustrator used, Butz said. "I never knew he took photos of everything."